After the acquisition of the land in 2015, the development project continued to enter its final stage: the construction of the building. 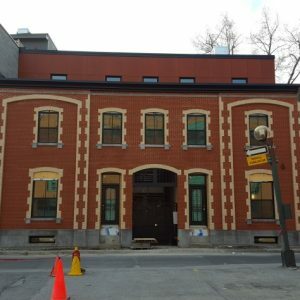 While working with its partners, Projets Autochtones du Québec, formerly lodged thanks to the City of Montreal, became the owner of a new building during the year. As for the construction site, we had 19 site meetings (every fortnight) with the professionals who supported us well in front of this big project: Ruccolo & Faubert architects, Blenda construction and Atelier Habitation Montreal. The initial schedule was deferred several times, to enter our new premises in May 2016. Note that the site went well. We also involved the members. We held four meetings during the year with PAQ users to explain the mission and objectives of the Transition House project: 70 people were reached. We also met with 25 residents of the shelter (who had already completed the Housing Application Form) to present the transition room accommodation and services contract. We made presentations on the service and accommodation contract in Ivirtiviq (20 people), the Montreal Urban Service Center (CDRHPN) and Chez Doris (6 people). A review of the first year will be produced to analyze the tools developed, the strengths of the program and also the difficulties encountered. This year’s goal will be to consolidate the program. Projets Autochtones du Québec is continuing its efforts to diversify funding sources and build core funding, primarily through the implementation of a fundraising strategy. Many Aboriginal women who are homeless experience precarious situations and extreme violence. Despite the fact that they experience these situations in a repetitive way, they use very little of the services dedicated to them. Projets Autochtones du Québec has therefore set up a project to document the factors that can prevent women from accessing justice or community services. Subsequently, our goal will be to build a support framework and make intervention recommendations. We completed a fundraising feasibility study and, based on the study’s recommendations, the Board decided to hire a fundraising officer for the 2017-2018 year.